Warning: I am waxing in this post, it might be a little too much for the average audience member. Understandable. Carry on. I want to tell you what I assume you are supposing to hear: that I am miserable. I am two weeks "overdue" and I can't go on. I ache, I hurt, I am puffy and impatient so that you can say, "Oh you poor thing." Perhaps I am a bit achy. A little hurty. As of last night I started to puff-out and my impatience tends to grow just before bedtime and The Chief is working on his living room stuntman routine on the pillows, couches and my body (if it gets in the way). But the truth is, I am in one of the happiest periods of my life. I am in this sweet holding cell of time. I have no commitments because I knew to wipe my calendar clean for this month. I can stay at home and sit or sleep or eat or just laugh at my children who rotate around me like bouncy planets to the empire sun. If we want to go out, out we go. If we want to stay in, there are plenty of projects and Winnie the Pooh to occupy our time. My wardrobe has been entirely re-outfitted, full of soft, new clothes fit for the post-partum weeks ahead. Even my hair is in total cooperation these days, which is nothing short of a follicle miracle. Today we went the French bakery to buy pumpkin tarts for our neighbors--which we'll deliver as soon as naptime has concluded. It's cold outside now, but even November's gray palette is inspiring. My house is clean, organized and bright. We have a kitchen full of food and a fridge stocked with drinks. Friends and family stop by to check in, bearing treats or good will. There are hourly texts on my phone from brothers to editors with jokes and teases. I've had the loveliest notes of encouragement from my inbox to my mailbox from readers all over the world. And there is enough new music in our home to play on night to day thanks to our generous musician friends. This time around, I am not afraid of these sporadic contractions and welcome them as sensations to be celebrated. I take them as signs of promised progression. My body feels so soft and lovely, full and strong. And the angels have started to make their appearances in my nest. They come after prayers and blessings and stay long into the nights I can't seem to sleep. That's not to say there aren't moments of intense feeling. Some nights I sob over wanting this period to be over. I want the baby in my arms. I want to smell the head of a freshly newborn and I'm anxious to breastfeed and cuddle and familiarize. I feel the weight of everyone's wait. I know there is anxiety, I know there is worry, but I'm satisfied and peaceful about the where we've been and how we're going on. This is something infertility taught me: you can't rush a baby. Above: I am showing off my two newest onsies today! 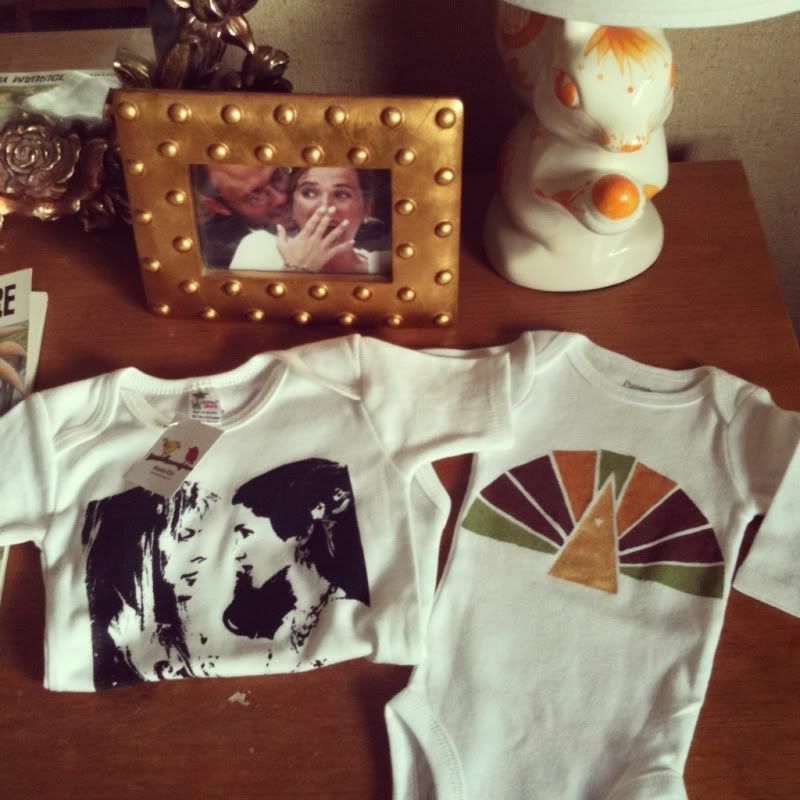 The turkey tee comes from the cleverly talented Heather of The Coterie Blog and my newest crush, Alison from The Little Tiny. The other onesie comes from my Australian buddy Sarah Kate Uhe Redux (if you don't know the reference of the print I am not sure we can be friends).